Nicholas Buc is a composer, conductor, arranger, violinist and pianist. He studied Composition with Brenton Broadstock and Dr. Stuart Greenbaum at the University of Melbourne, where he received the inaugural Fellowship of Australian Composers Award. As the recipient of the Brian May Scholarship for Australian film composers, he completed a Master’s degree in Scoring for Film and Multimedia at New York University, studying with Ira Newborn and Paul Chihara as well as receiving the Elmer Bernstein Award for Film Scoring. Continuing his passion for music and film, he conducted the live-in-concert world premieres of John Williams’ Close Encounters of the Third Kind, Alan Menken’s Beauty and the Beast and Nicholas Hooper’s Harry Potter and the Half-Blood Prince. Other live film concerts he has conducted include Pixar In Concert, Star Trek, E.T. the Extra-Terrestrial, Back to the Future, Casino Royale, Raiders of the Lost Ark, Jurassic Park, Psycho, Star Wars: Episodes IV, V, VI and VII and the first three Harry Potter films. He has conducted all of the major Australian symphony orchestras as well as the Minnesota Orchestra, Houston, Milwaukee, Indianapolis, Austin, Grand Rapids and Madison symphony orchestras in the US. He also makes regular appearances in Asia, conducting the Tokyo, Hong Kong, Malaysian, Osaka and Taipei Philharmonic orchestras. Nicholas is regularly commissioned and some of his works have been premiered by the Royal Melbourne Philharmonic Orchestra and Choir, The Australian Voices, the Melbourne Chamber Orchestra, the Benaud Trio and Concordis Chamber Choir. He has also written for film and television, with some of his work being screened at festivals and theatres around Australia, Asia and the US. In 2007 he was nominated for “Best Original Song Composed for the Screen” in the APRA-AGSC Screen Music Awards, and in 2015 was a winning finalist of the NYU Film Scoring Competition. He has been adjudicator of the Original Composition sections at the Dandenong Music and Arts Festival and the South Eastern Arts Festival, as well as Musical Director for Windmill Theatre Company, receiving both a Lyrebird and Music Theatre Guild nomination for Best Musical Director. 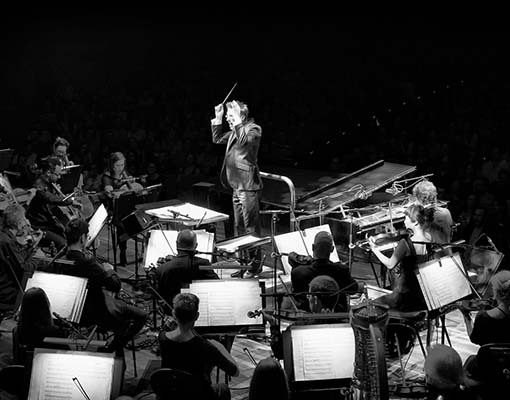 Recent conducting engagements include concerts with Grammy-winning US trumpeter Chris Botti, Amanda Palmer of The Dresden Dolls fame, and the Australian national tour for singer-songwriter Ben Folds. Nicholas has worked with Tina Arena on six Australian tours, writing new orchestral arrangements and conducting the Sydney, Queensland, Adelaide and West Australian symphony orchestras. He has also written arrangements for Missy Higgins, Passenger, Eskimo Joe and The Whitlams, as well as working on five seasons of The Voice Australia. His orchestral arrangements for the recent shows All You Need Is Love (The Beatles), Stairway To Heaven (Led Zeppelin), Nothing Has Changed…Remembering Bowie (David Bowie) and Praying For Time (George Michael) have been enjoyed by audiences around Australia. In 2009 Nicholas was commissioned to write an hour-long cantata mass for the centenary of the death of Mary MacKillop, and 2008 saw the premiere of his Requiem Concordia, commissioned by Concordis Chamber Choir to mark their 10th-anniversary. After a string of infamous pop covers, his long-standing affiliation with the Benaud Trio culminated in a new commission, Trailer Music, which has been released on their debut album. This piece was recently the subject of a new film created by 6 emerging filmmakers in conjunction with contemporary music group anon., and was featured at TEDxFoggyBottom in Washington D.C. He is currently completing work on a major theatrical work, TROT. Written with lyricist Gordon Lindsay, it is a new musical based on Charles Dickens’ much loved David Copperfield. He also recently completed a new ballet score, Kazka, for Lehenda Ukrainian Dance Company, which toured throughout Australia, Canada and the US.